My trip to Turkey 2: Bursa | Me fail? I fly! Bursa was besieged by nomadic Turks led by Oman Gazi, founder of the Ottoman lineage, in 1315. Eleven years later the starving city surrendered to Osman’s son, and the Ottoman Empire was born. Our little group of temporary nomads got there yesterday by ferry and bus, and there was very little starving going on, this being the birthplace of Iskender kebab. It was at the end of the Silk Road at one time, and even today there’s a lot of astonishingly cheap ‘100 percent silk’ scarfs on sale in the Silk Markets, which a number of us found irresistible. Also irresistible to most of us was the famous hamam at Çekirge mineral baths, which I’m told is luxurious with marble, very hot and not at all the punishing experience that a bath and massage is in some places. We were mostly a little ambivalent about the talk, and had some misgivings as we followed him out into the evening. But he took us to the back room of a teahouse where some of the locals were singing and playing Turkish folk music. The room was big enough to accommodate around its walls the musicians, the thirteen of us, and four or five others. Glasses of tea were brought, and what followed was an hour, or possibly two, of joy all round. Our flute-playing friend left after playing beautifully for quite a spell. Drummers came and went – a Turkish man on the way home from work who tapped out a basic rhythm, two young men whose finger work was brilliant. Two middle aged men who sang and played the sas (I can’t look it up, it’s like a balalaika with the hole at the bottom rather than under the strings) seemed to be in charge, and enjoyed each other, the other players, and us to a spectacular degree. They sang and played. Four young Japanese men came for a while and left. One by one we were cajoled into dancing. One of our younger women had clearly learned Turkish belly dancing and did herself proud. The five men of our group got up together, shook our hips and bumped shoulders. We joined in singing on a couple of simple refrains. Eventually, the instruments were returned to their hooks on the wall, and after much handshaking and kissing on both cheeks, we filed out, paying one Turkish lira each for the tea. We’d been told that there was no charge for watching dervishes whirl because it was a spiritual practice, not a performance. Perhaps the same could be said of this event. We dispersed, found dinner where we could – my small group found it in a kebab house that turned out to have a Turkish pop duo drowning out any conversation, but giving a kind of musical completeness to the evening. We reconvened and walked to the Dervish Lodge. The Lodge’s crowded grounds were dominated by the video image of a bearded man sitting crosslegged and holding forth – the sermon had already started. There was a festive air all the same, not inattentive, but not exactly hushed. We were escorted into a front parlour and offered the now familiar strong black tea. The sermon went on for an hour. This was not fun, though Burak, our leader, took the opportunity to give us his version of Sufism and the origins of whirling: the man known in the West as Rumi had a dear friend and comrade named Shem; when Shem was killed words were not adequate to express the great poet’s yearning for his lost friend and he began to whirl; his followers saw him do it and imitated him. At last the sermon, which had sounded at times like a Downfall soundtrack and had been in part about the evils of Facebook, came to an end, and we were ushered into the crowded viewing areas of the whirling room (click here for a virtual tour), women upstairs, men downstairs and children wherever. The man who had given the sermon sat at one end of the room, the six dervishes in their felt tombstone hats and white skirts came in opposite him, one by one, each bowing solemnly to the one after him, before he began whirling. My guess of the age range is 30 to eight years old. Once they were all started, each in his own space, the music started, hypnotic, vigorous, beautiful. And they whirled for what seemed like forever, both hands raised or one up one down, head at an angle, eyes sometimes closed, progressing around the room and never coming even close to a collision. It was an incredible physical feat, but that was almost beside the point. People in the audience (or should I say congregation?) swayed where they sat, and some wept. After a long time, the bearded man and the man in a black robe who played some kind of leadership role joined in, rotating more slowly, the older man with tears streaming down his face. Then they stopped, stood for a moment, sat upright and motionless on the mat for a long, impassioned call-and-response prayer, sweat dripping from their faces. It must say something about my mental state that I thought the repeated response was habib. (The Art Student assures me it was nothing of the sort.) It was a huge privilege to be a guest here. Next morning, we paid a quick visit to the Ulu Cami (High Mosque), which was built for an emperor long before the conquest of Constantinople. The biggest piece of calligraphy was the emperor’s name. There’s a pool for ablutions in the mosque itself, and a very beautiful wooden pulpit made of 66,666 pieces with no nails or glue. 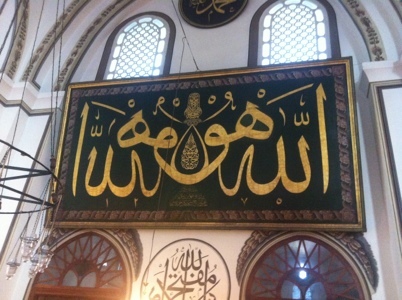 Burak explained enough of the calligraphy that I can now recognise the name of Allah, the mystic syllable hu and the character wow (pronounced v) which has mystic significance because it curls back on itself like a foetus or a traditionally buried corpse. I’ve iPadded this almost entirely on the six hour bus ride to Selçuk near Ephesus. 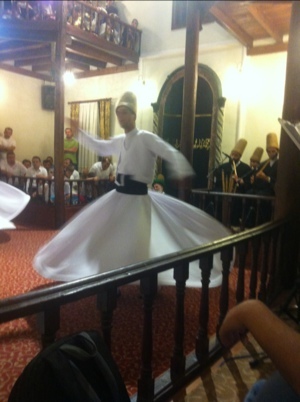 This entry was posted in Diary, Travel and tagged Bursa, Sufism, Turkey. Bookmark the permalink. Lovely blog. I’d love to see the place, but this is a pretty good substitute Johathan. Keep it up. The Dervs have it wrong and you have it right. You are important. This vast thing they talk about-the universe-is mostly made of little rocks and other inert things which can’t even move on their own. No, the thing that really matters is life (which both move and evolve). Moreover, as self-conscious entities, we humans and other forms like us, are at the top of the life totem pole. There. (Still, I used to like to whirl aound when I was a kid. It made me totter waywardly around the room afterwards, which was the closest thing I ever had to an eastern religious experience. I’m inclined to do it again–right now, in fact. Here I go. Oh… ). Opps! It just occurred to me that I became a great-grandfather four days ago. All this time, and I’m still 12. I was 11 when we encountered each other back in the 80s, but I’ve been advanced to 12, against the better judgement of those who know me well. I hope you like olives. I suspect you’ll be seeing a lot of them on your little jaunt. Take care. Your travel tales are having their effect on this head in Western Canada (Medicine Hat). I’ve been prompted out of curiosity to listen to some Sufi Music (Yiahi in Makam Dugah [Sufi Music Ensemble]). I think there was a lost coyote somewhere in the opening bit. (And now I know where Ravel got his Bolero from.) Anyway, it’s quite engaging. I can see those guys swirling around and around, faster and faster, until their tails fly out and God is finally satisfied.